1. Local is a good angle. One of the more surprisingly engaging classes of the day was one on the utilization of archival footage, featuring documentary filmmaker Tom Jennings, a former investigative reporter who has done a number of documentaries consisting exclusively of archival footage, including “The Assassination of Martin Luther King.” He said that one key to doing a historical documentary utilizing footage from the time exclusively is to find an angle. For a documentary on 9/11, he used news reports and footage from other parts of the country, since most 9/11 documentaries are focused almost entirely on reporting from the northeast. But local, he says, is always better. As Jennings said: “We try to stay local and the reason is that you want it to feel like you’re watching it for the first time. You’re seeing newscasters whose faces and voices you’ve never seen before. Walter Cronkite is a familiar face and we try to find the unfamiliar faces who are just as enthusiastic about the reporting that they’re doing.” This, of course, can occasionally lead to thorny legal issues, since the local affiliate and the network usually has to sign off on usage. But there’s no bigger enemy to documentary filmmakers than… the Internet. 2. Never take anything from the Internet. 3. It all comes together in the sound mix. 4. Don’t worry about hiring a composer late in the game. 5. Don’t fear the temp music. Temp music is often placeholder music, made up of other bits of film score, meant to get scenes a general atmosphere or emotional tenor. Griffin admitted that, “Temp music is loathed by composers.” But that there’s no need for it to be. He said the “E-Team”temp music was “a very useful thing,” adding that, “it worked as a springboard for a lot of creative things.” So, if you’re looking to create the music for a documentary feature, don’t get scared off by the music that’s in place. 6. Sometimes you find the narrative structure along the way. 7. Music can change everything. 8. Animation is a great way to get information across. During a master class on the use of animation and graphics, which featured Jillian Schlesinger (the director of “Maidentrip”), Nick Clark (an editor), Diana Whitten (director of “Vessel”) and Emily Hubley (an animation director on “Vessel”). They all agreed that animation is a wonderful way to get information across in a concise and informative way. Whitten said it was beyond necessary for “Vessel,” a movie which documents the legal ambiguities of a ship-bound medical center that gives abortions to women who live in countries where it is illegal. “We had a lot of stuff to set up – all of these details. And every time we showed it to audiences, everyone was overwhelmed. That was a main reason,”Whitten said. “The other reason is that we wanted to have medical information that could be exported, where we could use it virally and in educational purposes.” For Schlesinger, it became apparent that she needed the animation to detail where and how the young girl at the center of her film sails around the world. This master class was so information-packed that it could have used its own animation. 9. Animation is also helpful when you don’t have footage or can’t film certain sequences. Clark edited “The Life and Mind of Mark DeFriest,” the story of a man who was arrested for a petty crime when he was a teenager and has spent the rest of his life in prison. He detailed an animated sequence that recounted the number of times he was written up for bad behavior, and what’s so amazing about the sequence, rendered in a graphic novel style not unlike something like “Sin City,” is that it clearly marries a number of recorded interviews (of varying degrees of audio quality) and also really showed you what it was like inside the prison, even it was produced in a stylized aesthetic. 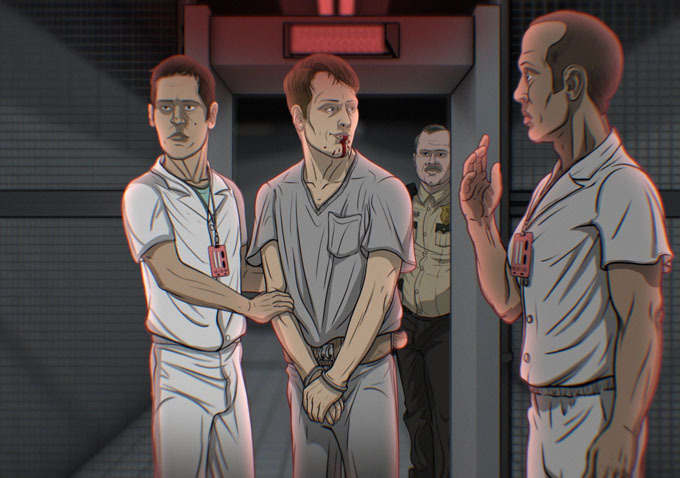 Since there weren’t any cameras when Mark had his shoes shaken out or when a prison guard beat him up, animation can save the day. This may sound like a trite platitude, but listening to these filmmakers talk all day about the process, that was something that almost all of them would certainly express to you. “The Life and Mind of Mark DeFriest” director had been accumulating research for 14 years, Jennings nearly had an entire film fall apart due to rights issues at local television news stations, and many other creative principles had films that were so hot button that it seemed like even if they were finished, they might never screen for audiences. But at the end of the day (and at the end of my day spent with these filmmakers), they all have amazing final products to show the world, to be proud of, to make the investors happy. And that’s what’s really important. If they had given up, waved the white flag during a particularly different phase of production, they wouldn’t have anything to show for it. READ MORE: Are Graphics and Animation Revolutionizing Documentaries?